With no new lead actor to introduce at the start of this series, Steven Moffat wastes no time in catering to the true fans of the series. Michelle Gomez’s Master/Missy, Julian Bleach’s Davros, and the Daleks all make their return, and the action picks up right from the start, beginning to set up plot points that will surely have ramifications later in the run. Peter Capaldi’s Twelfth Doctor is introduced dramatically as he attempts to rescue a young boy from a visually fantastic and harrowing field of handmines. The moment the boy reveals his name as Davros, though, the tone instantly changes and the Doctor suddenly shows a rare moment of uncertainty, superbly channeling Tom Baker in ‘Genesis of the Daleks’ as he holds the early fate of one of his most dreaded foes in his hands. It also brings back the continual inner turmoil of the Twelfth Doctor in needing to decide if he is a good man or not. The dilemma of that opening scene is left unresolved, and Capaldi actually remains off-screen quite a while afterwards, wanting to remain hidden; the benefit of the added emphasis on two-part stories this series is that it allows more time for introductions and background without feeling rushed, even when initially doing a whirlwind tour of various familiar locales while following Clara or the serpentine man Colony Sarff. The big challenge facing Doctor Who this year is finding another interesting path for Clara to take. After the impossible girl arc and the doomed relationship with Danny- capped with much debate about whether or not she would stay aboard the TARDIS- she was a bit of a blank slate following the events of ‘Death in Heaven’ and ‘Last Christmas.’ As of yet, her role in the show seems undetermined except that she’s vital to everything. Jenna Coleman is excellent as ever, and teaching, heading up UNIT, negotiating with the Master, and finding the Doctor via anachronisms (and what a spectacular entrance the Capaldi delivers as he is clearly having a blast) are all in her immediate repertoire, but there’s just no sense of personal emotion or frailty to add an extra level of resonance to her impressive routine. As mentioned, though, the main draw of this episode is the combination of villains. Missy is unabashedly back, Michelle Gomez effortlessly reprising her role that was such a highlight of the previous series. Her already trademarked sardonic wit and casual brutality is on full display, and it’s a testament to how strong and well-rounded she is that she can stand out when surrounded by so many other captivating characters. In particular, it’s the Daleks who have received a bit of a temperamental overhaul. The Daleks on display are taking no prisoners, and by episode’s end they have destroyed the TARDIS and shot both Missy and Clara. While it’s reasonable to believe all will be well come the next story, the strength and audacity of the Dalek force on its home world of Skaro still delivers a bevy of continued shock and allows Capaldi to display some of his finest, most heartfelt, and darkest work yet. All of this is not to downplay the immediate impact of Davros, both the emotion and helplessness as a child stranded in the minefield and the gravitas of Julian Bleach’s portrayal in his dying years secluded on Skaro. The lingering question of who made Davros is an alluring one full of potential, and it’s clear that Davros will have a much bigger role to play in the second half. 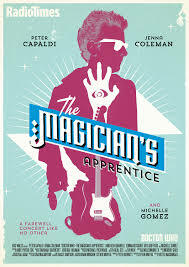 ‘The Magician’s Apprentice’ is a fast-moving reintroduction to the worlds of Doctor Who, and the sheer onslaught of characters- all of whom are on top form already- and locations is incredibly impressive. The Doctor is no stranger to contemplating the end of his lives, but just what the Confession Dial is and how it will play into events later on will be very interesting. For now, the pieces have all been set in place for a fantastic finale, one with a very emotional and unpredictable Doctor surrounded by his deadliest foes, and ‘The Witch’s Familiar’ will have a lot to live up to after this masterpiece.